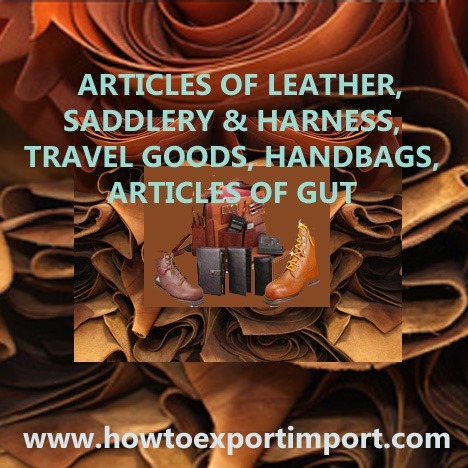 In this article, the Harmonized System codes (Harmonized Tariff System- HTS) for ARTICLES OF LEATHER, SADDLERY and HARNESS, TRAVEL GOODS, HANDBAGS, ARTICLES OF GUT are mentioned which help you in exporting and importing of ARTICLES OF LEATHER, SADDLERY and HARNESS, TRAVEL GOODS, HANDBAGS, ARTICLES OF GUT. These codes help exporters and importer all over world to know product classification code named differently in each country like Schedule B, ITC, HS, HTS, Tariff Code etc. For example if you need to export or import ARTICLES OF LEATHER, SADDLERY and HARNESS, TRAVEL GOODS, HANDBAGS, ARTICLES OF GUT from/to any country, the customs department and other government and non government agencies of respective country identify your product on the basis of harmonized system code. If you are importing or exporting ARTICLES OF LEATHER, SADDLERY and HARNESS, TRAVEL GOODS, HANDBAGS, ARTICLES OF GUT, the 6 digit harmonized system code mentioned in this article is accepted all over world. In other words, the export and import of ARTICLES OF LEATHER, SADDLERY and HARNESS, TRAVEL GOODS, HANDBAGS, ARTICLES OF GUT are categorized productwise under the information mentioned here. These harmonized system codes (HS codes) have been displayed in this web blog in a systematic order to make you understand and identify easily. I hope, the information in this article helps you for smooth import or export of ARTICLES OF LEATHER, SADDLERY and HARNESS, TRAVEL GOODS, HANDBAGS, ARTICLES OF GUT. 4206 articles of gut nesoi, of gold beater's skin etc. Aliace: On 14 February 2015 and want to start my business of CHA for this I want a license of CHA and unfortunately I missed this chance for appearing the examination for Licensing of CHA. In this regards I want some practical training for this purpose so that I will be well prepared.And also please guide me from where I can get the study material for the preparation of examination.Please help me if u can. I am having the basic knowledge of Import/Export and Custom clearance. ABHAY BHALERAO: On 16 February 2015 DUE TO SOME PROBLEM I LEFT TEXTILE INDUSTRY AND ENTERED IN BUSINESS AT THE AGE OF 42.ENTERED IN PARTNERSHIP WITH 3 PERSONS, ALL OTHER ARE WORKING FELLOW, I AM 100 % DEPEND ON THIS BUSINESS,SINCE LAST YEAR TRYING TO GET ORDER, RECEIVING ENQUIRIES BUT BUSINESS IS NOT GETTING THROUGH.MEAN WHILE FOUND ONE FINANCE PROVIDER, WHO WAS ALREADY IN EXPORT OF IRON ORE.WE ARE IN POSITION TO SUPPLY ANY QTY OF - SOYA MEAL , RICE ,WHEAT , MAIZE , SUGAR ,INDUSTRIAL SALT, CEMENT,STEEL , WINE, LIQUOR , BEER, TEXTILE ( YARN / FABRIC / GARMENT - ANY SORT OF TEXTILE ).WE WEL COME ANY ONE WHO WILL BRING GENUINE BUYERS FOR US. WE R MERCHANT EXPORT FIRM, CAN SHARE THE PROFIT / CAN PAY CONSULTATION . DUE TO YOUR BLOG WE ARE ALREADY ATTACHED WITH YOU. WE ALSO WANT TO REQUEST YOU TO PROVIDE YOUR GUIDANCE AND YOUR BLESSINGS. mudassar ali : On 13 October 2015 We have Munefacture Leather Produced Leather Garment Leather Gloves ,Working Gloves Wait lifting Gloves and all Kind of Gloves Leather jackets all Kind Leather wast Bags ,Leather Belle Bags and Other Leather Produced my company Munefacture all produced pureLeather. We are used Sheep Skin,Cow Skin,goat Skin and Other and my Company price is less price and Quwalite is too Good.and Sampling is advance Payment and my Company all Price is FOB and i am Send the Company Link plz Check it so you are interested in Leather goods so Contact me I hope good Business Relation for incoming Future . iram: On 11 August 2016 Im iram from Pakistan. I read ur web site. Im really impressed by informations u hv given on ur page. I want to do business of import export. I want to export sports gloves. Can u help me regarding this. Im nothing at this tym but i want to be some1 known person in export feild. I need ur guidence n help. I hope u will.